Treasure hunters rejoice! A couple of enterprising detectorists (those who seek buried treasure with metal detectors) have once again proved that it can be a fruitful hobby indeed…the enterprising duo, Joe Kania and Mark Hambleton, unearthed the find of a lifetime in a field just south of Manchester. Their “hoard,” a bracelet and three neck torcs estimated to be at least 80% gold each, were either lost or buried 2,500 years ago, making them possibly the oldest known Iron Age discovery to date! Not far from another famous find, the “Staffordshire Hoard,” this locale seems ripe for the detecting. This bounty was uncovered by ‘local boy’ Terry Herbert in 2009, and has already garnered a generous bounty for the finder (it’s the law in Great Britain that all found artifacts must be turned in to the government, but also that they get reimbursed the full value! ), and the objects themselves have already been touring museums for some time! It will be exciting to see what happens to this 2017 discovery once its worth has been calculated by the British Museum, where it is currently being kept on display. To get an eyeful of the famous 2009 find attributed to ‘local boy’ Terry Herbert and the garnet-encrusted goodies he unearthed, check out the hoard’s official website (…or, for a closer look, just check out some gold and garnets at the Eve Alfille Gallery & Studio!). 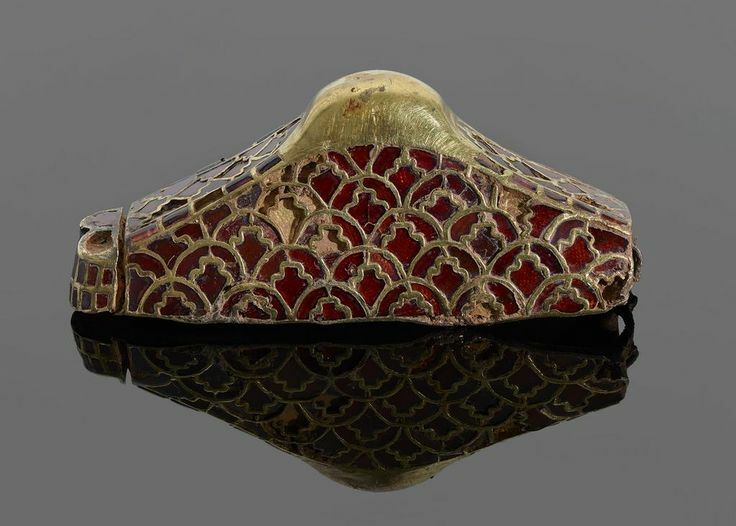 Garnet and gold pommel cap from the Staffordshire Hoard. Is your bathroom a bit boring? Is your lavatory too lackluster? Leave the porcelain to the plebeians! 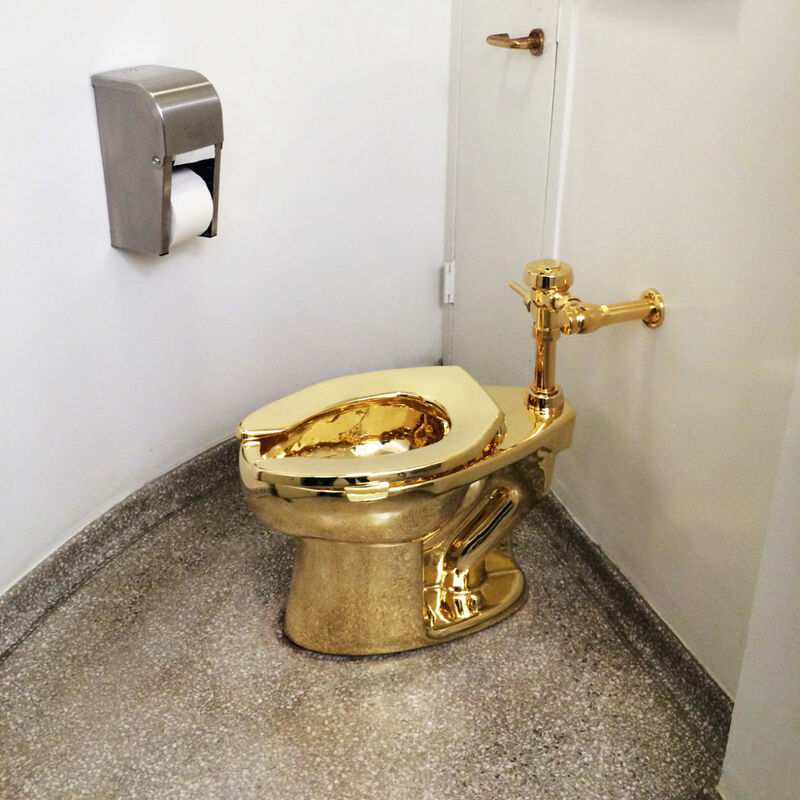 The latest in privy improvements can now be experienced at the Guggenheim Museum in New York since Italian artist and editor of “The Toilet Paper” magazine Maurizio Cattelan has unveiled his latest exhibit: America. Ironically, despite the perniciousness of the plumbing, this is not the first golden toilet to grace bathrooms of the world (despite its clever monicker, “America”). In Hong Kong, a 24 karat solid gold toilet is included in the Hang Fung Gold Technology Group’s showroom. Elsewhere in Asia, a Saudi King kindly gifted a golden toilet to his daughter on her wedding day with the additional present of a wedding dress designed to embody all the glamour and style of the ancient pyramids. This strikingly geometric silhouette is the boldest choice in design since Marcel Duchamp’s “Fountain,” another bathroom accessory fit for the annals of art history. We know that you love Eve already, but did you know that she also uses a wide variety of materials in her jewelry that conform to the same high moral standards that you do? Read Eve’s answers to questions regarding where her materials come from, and how they are each ethically-sourced, conflict-free, green, and gorgeous. For anybody who’s ever sought diamonds both for clarity AND for conscience, for any responsible brides seeking a humanitarian, globally-mindful companion for life other than her spouse, or even anybody seeking an extra-thoughtful anniversary gift. A selection of rings by Eve Alfillé. Photo by Matt Arden. 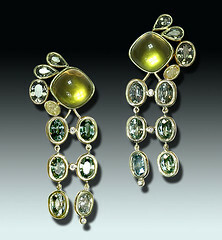 Where do the Eve Alfille Gallery & Studio metals come from? We get our metals from a company called “Harmony Metals,” and they are virtually 100% ethically-sourced and recycled. Where does Harmony Metals procure these metals? In this country, recycled gold comes from people who sell gold that they no longer want, and then the refiners will buy it. It used to be that there wasn’t much emphasis on this…people had their own gold, and it just stayed in drawers. Companies would go tear the earth up and mine new gold to satisfy the demand. Now, with more interest in reusing, adapting, and saving the environment, they discovered that there is quite a resource right here! Refiners take this gold and refine it, removing any impurities, and return it to a form where it can be reshaped into entirely new pieces. And this is, in a way, the circle of life as applied to metals. Where do the beautiful diamonds in my Eve ring come from? When it comes to diamonds, it’s important to know that the sources have changed tremendously in the last 20 years. It used to be that most diamonds came from South Africa, and that provoked a lot of conscience-searching, because you have apartheid, and political reasons, so a lot of people felt badly about that. Some diamonds come from countries where there is a lot of conflict, like Sierra Leone in Africa, but those diamonds are not traded in the market generally. Dealers have gotten together internationally, and are very careful to not purchase diamonds from those sources. Everyone wants to stay away from it…There was a big meeting some years back, and a document called the “Kimberly Agreement” resulted in those diamonds being banished from the trade (kind of). Now, the big change is that today, a little more than one third of all diamonds actually come from Russia. It turns out that Siberia/Russia has wonderful diamonds, and large mines that are very well-run. They pay the people that they employ, they cut the diamonds very well, and a lot of the diamonds that are on the market now (one third, as I said) are from Russia. Another 25% come from the Arctic Circle, or close to it, in Canada. In 1996, I was at a big reception at the Gemological Institute in California where they introduced the people who actually discovered those diamonds. They were prospectors who were flying, and noticed that the terrain looked a little different. They had a hunch. So, ever since, a quarter of the world’s diamonds of high quality come from Canada. 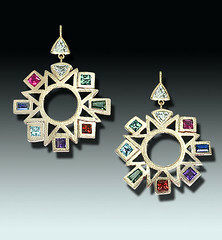 Small diamonds that you see are usually cut in India, but India doesn’t really have that many diamonds. So if they are champagne, or pink, then they probably come from Australia. If they are small and white, and well-cut, they probably come from Russia. Some countries off the coast of Africa, like Angola, mine in th ocean! They found some diamonds on the beach, and so there are now ships that are anchored offshore. They drag up some of the water, find diamonds in the water, and then they just send the water back out. So, interestingly enough, some diamonds actually come from the ocean. Can you repurpose a family diamond if I already have one? Yes, and we often do! This is rather nice; to know that the diamond that you are using is such a family symbol…a symbol of belonging, that actually comes from either one of your families, and I think it’s especially wonderful. We encourage people to ask family members if they have stones that they would wish to donate, and if they’re willing to do that, we’re very happy to work with them! A piece simultaneously new and old, Eve has just unveiled her incredible “Ancient Echoes” necklace. “Ancient Echoes” necklace ©Eve Alfillé, Photo by: Matt Arden. In case her stunning relief pendants, depicting Romans doing as Romans do, do not excite your sense of history; in case her tiny silver replicas of bread found still sitting in Pompeiian ovens, or her evocative and emeralds, are somehow not enough to inspire in you a sense of what living and dying in Pompeii would have been like, then “Ancient Echoes” is your solution. 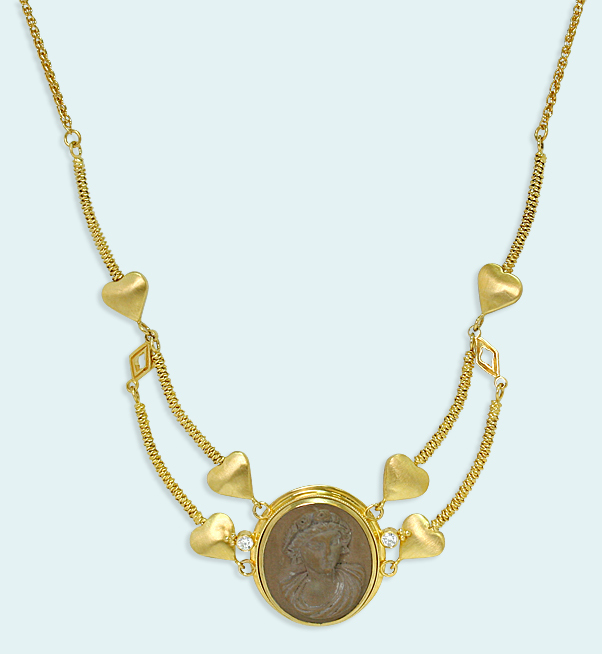 Carried in a sentimental, yet elegant necklace of gold, there rests the cameo of a beautiful woman’s face, surrounded by heart-like shapes depicting her covetability. Her soft, enigmatic features have all been lovingly carved from a smooth, cool-colored stone that is not immediately identifiable to the untrained eye…it is, in fact, an actual specimen of Vesuvian lava, carved from the very rock that spelled out destruction for the idyllic resort town of Pompeii all the way back in 79 A.D. 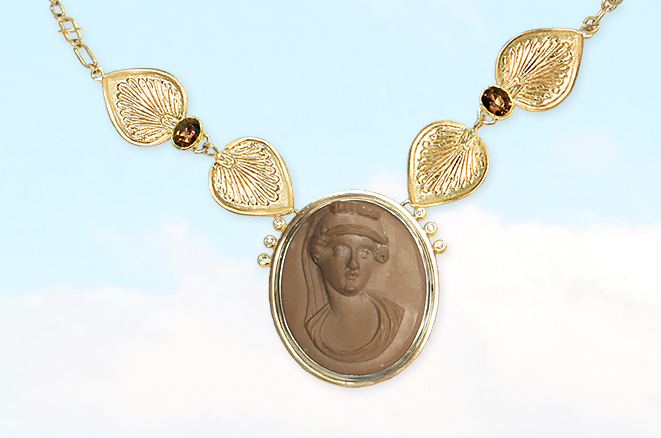 This simple, yet lovely cameo has left many a bookmark between the pages of the centuries that it has travelled since the great eruption where it hurdled, boiling and red hot, through the air and into the homes of the Pompeiian elite. The female form on the lava came into being much later, being carved into the volcanic rock as late as the 18th century (or as the ever-romantic Eve calls it, the time of Jane Austen.) It took almost another 200 years, near the dawn of the 21st century and over 2,000 years since the eruption of Vesuvius, for the cameo to pass into the skilled hands of Eve Alfillé and be made back into a wearable piece immortalizing its heritage. “Via della Fortuna” necklace ©Eve Alfillé, Photo by: Matt Arden. Today you can see her at the gallery, along with her lovely sister, “Via della Fortuna,” both politely waiting, as they have done for centuries, to again be bestowed with the gifts of life and of motion. 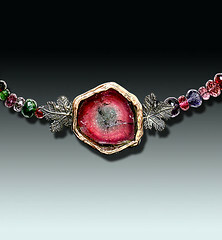 This Saturday, prepare to be refreshed and sated by Eve’s celebration of “the Garden of Eden,” her latest collection of art jewelry, as the gallery dedicates an entire day to the remembrance of a time and place in which perfect peace, plenty, and oneness between all created things reigned. Featured below is a pair of matching wedding bands which are to be released, each entitled “The Tree of Knowledge,” which offer both “his” and “hers” sizes (or “Adam” and “Eve,” as it were) to complement one other as well as any two soul mates do today. Natural shapes weave their way throughout 18 karat gold bodies, with designs which branch out into stunningly organic formations that seem to bridge the divide between the unplanned orchestra of nature, and the careful planning and cultivation of a garden. Alongside these two intricate golden wreaths is the soon-to-be-unveiled final addition by Eve, creating a perfect marital trifecta: her newest diamond engagement ring. To see all three together, be sure not to miss the opening party taking place on Saturday, November 15, from 1 to 7pm. Even if she wasn’t made from your rib, this may be the perfect opportunity to view and admire Eve’s latest spellbindingly-wrought series of rings, and perhaps they will become the perfect symbol of your love to the apple of your eye.